Cresco Labs Inc. is a cannabis company operating in 11 states having 15 production facilities and 51 retail licenses. Based in Canada, Origin House operates in the global cannabis industry and focuses on California. The business combination is expected to target a 185 million market offering more than 56 brands in collaboration with more than 725 partners. Cresco Labs has experience of acquiring other competitors, which most M&A analysts should appreciate. It means that the company knows well how to integrate new businesses. Using an EV/Sales ratio of 20x and forward revenue of $167 million, the total enterprise value should be equal to more than $3 billion. On April 1, 2019, Cresco Labs (OTCQX:CRLBF) and Origin House (OTCQX:ORHOF) reported a merger agreement that may create a new leader in the cannabis industry. What matters the most in this deal is that the companies are expecting revenues of $383 million in 2019. If this is correct, using an EV/Sales ratio of 20x, the total enterprise value should be larger than $3 billion. 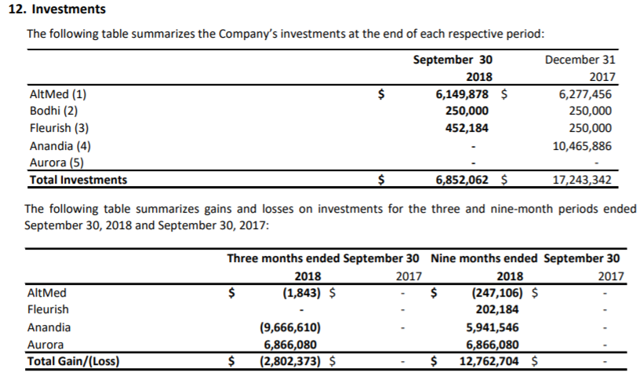 With this in mind, the fact that Cresco Labs has an enterprise value of $1.56 billion and Origin House has an enterprise value of $548 million represents a clear opportunity. They should have larger valuations. Based in Chicago, Cresco Labs Inc. is a cannabis company operating in 11 states having 15 production facilities and 51 retail licenses. The company offers several cannabis products including everyday cannabis, medicinally focused, connoisseur grade, and edibles. The images below provide some of the brands offered by Cresco Labs. Investors should get to know what these two companies are expected to achieve together. As mentioned in the presentation below, the business combination is expected to target a 185 million market offering more than 56 brands in collaboration with more than 725 partners. Cresco Labs has experience of acquiring other competitors, which most M&A analysts should appreciate. It means that the company knows well how to integrate new businesses, which increases the likelihood of closing the recent merger agreement with Origin House. On September 30, 2018, the company entered into a definitive agreement to merge a subsidiary with Gloucester Street Capital, LLC, a New York limited liability company. In the fourth quarter of 2018, the company completed its acquisition of 100% of FloraMedex, LLC for $10 million cash consideration. In Q4 of 2018, the company acquired 100% of Arizona Facilities Supply, LLC for $22.3 million. In Q4 of 2018, the company entered into a definitive agreement with MedMar, Inc., an Illinois corporation. Total consideration for purchase is $27.5 million, with $10 million in cash and $17.5 million in stock. In the nine months ended September 30, 2018, Cresco reported revenue of $26 million, 243% more than that in the same period in 2017. Market participants should appreciate that the gain from operations in this time period was $6 million and the net income was $6.5 million. It will be shown below that Cresco was reporting better gross profit margin than Origin House. Like many other peers in the cannabis industry, Origin House reported massive revenue growth in 2018. 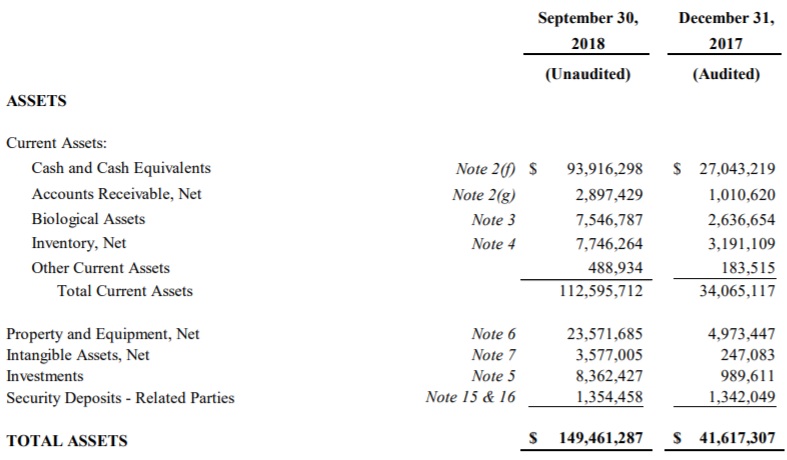 In the nine months ended September 30, 2018, revenue was equal to CAD 10.7 million, 438% more than that in the same period in 2017. With cash equal to CAD 75.2 million representing 34% of the total amount of assets, Origin House should attract many growth investors. Other relevant assets are intangibles worth CAD 49 million and goodwill worth CAD 55 million. Let’s understand these assets. They are not small. In the nine months ended September 30, 2018, Origin House reported revenue equal to CAD 10.7 million, 438% more than that in the same period in 2017. With this in mind, assuming forward revenues of CAD 50 million or $37 million seems reasonable in this case. In the same time period, Cresco reported revenue of $26 million, 243% more than that in the same period in 2017. Taking into account these figures, forward revenues of $130 million can be expected. In total, the business combination should be able to report forward revenue of $167 million. Note that the company is expecting to make a total of $383 million in 2019. Other analysts may use forward revenue of $383 million. 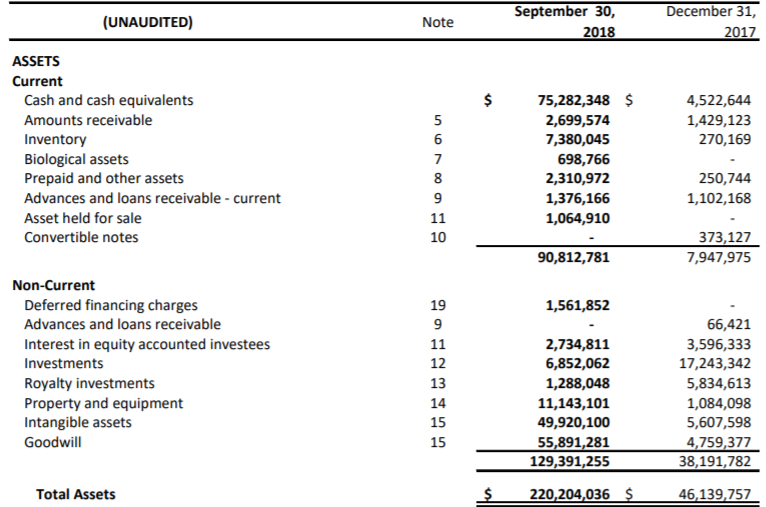 However, with CAD 10.7 million and $26 million made in the nine months ended September 30, 2018, $383 million appears to be very optimistic. As shown in the image below, cannabis companies are trading at 10x to 40x sales. It means that expecting forward revenues of $167 million and using an EV/Sales ratio of 20x, the business combination could have a total enterprise value of more than $3 billion. 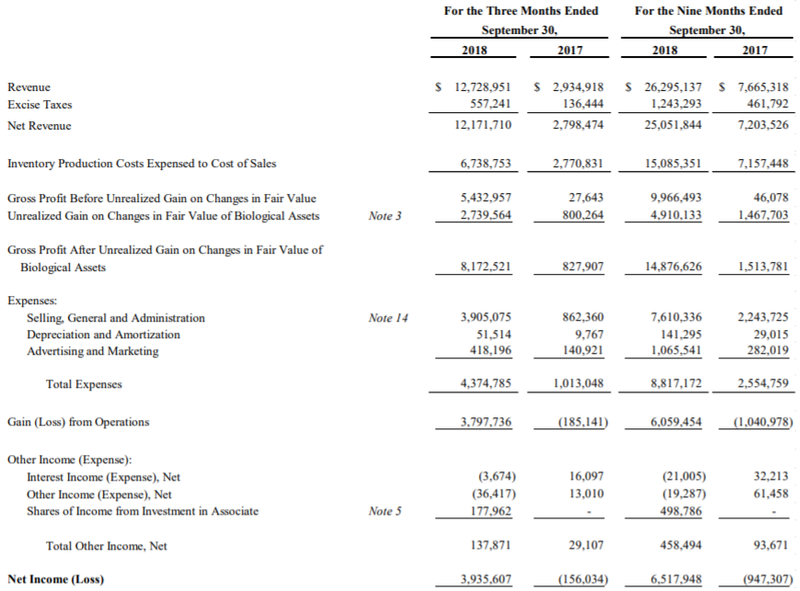 With that, if the new company is able to report revenue of $383 million in 2019, the enterprise value could be larger than $3 billion. Using an EV/Sales ratio of 20x again, the total enterprise value may be equal to more than $7 billion. Market participants should understand that this appears to be a very optimistic case scenario. 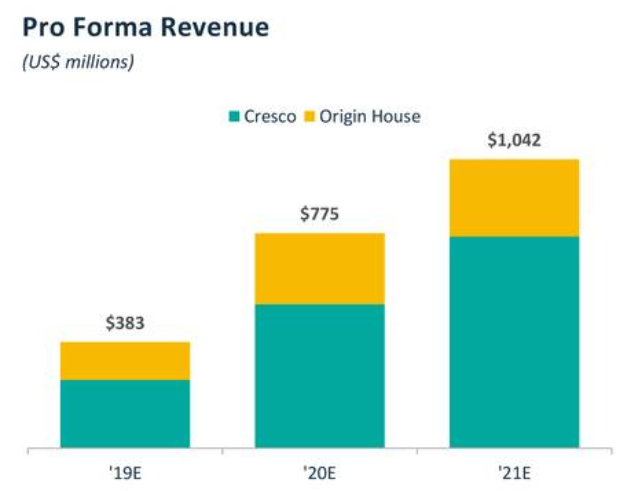 As of April 9, 2019, Cresco Labs reports an enterprise value of $1.56 billion and the enterprise value of Origin House (OTCQX:ORHOF) is equal to $548 million. With the company announcing that the business combination may generate revenue of $383 million in 2019, the valuation of these two companies is too low. 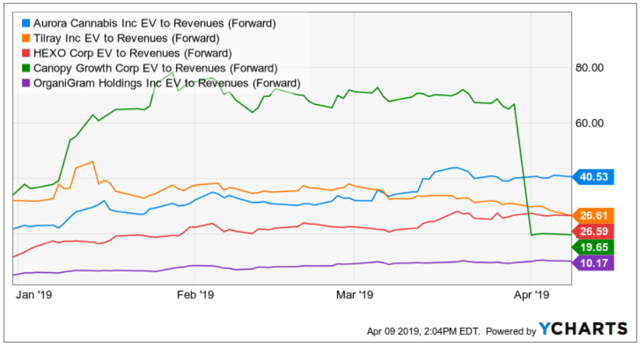 Using an EV/Sales ratio of 20x and forward revenue of $167 million, the total enterprise value should be equal to more than $3 billion. With all these numbers in mind, both companies represent an opportunity for investors. They should have larger valuations.